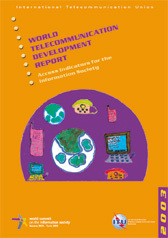 The 2003 World Telecommunication Development Report is a tool kit for measuring access to information and communication technologies (ICTs) and a synopsis of the current state of readiness worldwide for the information society. The need to rethink traditional indicators arises from today's emphasis on how the development of the information society is changing lifestyles, especially in how we communicate, work and play. Wider access to new technologies, especially the Internet, is crucial to overcoming the digital divide. It is determined not only by infrastructure but also by people's ability to afford and to use ICTs. The report evaluates indicators and statistical methodologies according to their ability to measure access to the information society, to understand national and global developments and to help make the right policy decisions. It also highlights the challenges in collecting data in developed as well as in developing countries. The report includes six chapters. The first chapter puts the information society in context, describing why new indicators are needed to follow trends and make comparisons. The second chapter discusses indicators for measuring individual, household and community access to ICTs showing their relevance for different policy objectives such as universal service or access. Chapter three looks at measuring ICT access in the key sectors of businesses, government and schools, where ICT use is crucial for electronic commerce; transparent and efficient public administration, and to encourage youth to participate in the information society. Chapter four examines the interrelationship between ICT indicators and the Millennium Development Goals (MDGs), which have attracted considerable attention as a standard for identifying and measuring global development objectives in the period up to 2015. Chapter five presents the ITU Digital Access Index (DAI). The DAI measures the overall ability of individuals in some 180 economies to access and use new ICTs. It allows these countries to see how they compare to peers and to identify their relative strengths and weaknesses. It also provides a transparent and globally measurable way of tracking progress towards improving access to ICTs. This will be an essential element in the implementation of the WSIS Plan of Action and in the use of ICTs to meet the Millennium Development Goals. In conclusion, chapter six offers recommendations for improving the availability of information society access indicators. The report will be published to coincide with the first phase of the World Summit on the Information Society (WSIS), to be held in Geneva, in December 2003. In addition to analysis and the DAI, the latest telecommunication and ICT indicators for some 200 economies worldwide are provided. Price: 100 CHF - Order Now !